Surgery can be performed to create a functioning tear drainage system where there is an obstruction to the tear duct causing a watery eye. 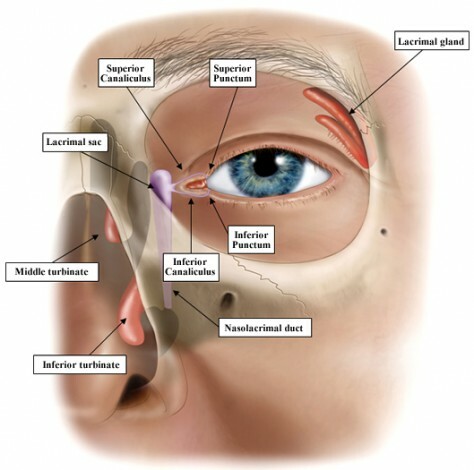 An external dacryocystorhinostomy (abbreviated as external DCR), an operation performed for an obstruction in the nasolacrimal duct, is undertaken using a small incision on the side of the nose. The success rate of this procedure in our hands is better than 95%. In the event of a failure the surgery can be repeated. During the surgery, the lining of the lacrimal sac is attached to the inner lining of the nose (the nasal mucosa) to create a new passageway for the tears. A fine silicone tube (a stent) is usually placed at surgery to maintain an opening in the tear drainage system. This is removed after about 6 weeks in the clinic. This takes seconds to do. This operation is usually performed under general anaesthesia in younger patients although it can be performed under local anaesthesia with intravenous sedation by an anaesthetist for older patients or for patient who are unfit for general anaesthesia. What are the possible complications of an external DCR? 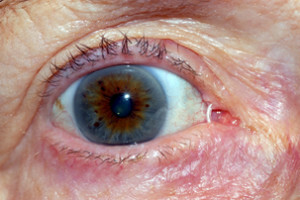 Injury to the surface of the eyeball (a corneal abrasion) that causes persistent pain. If the pain lasts longer than a few hours after the operation, the surgeon must be informed. Such a problem is extremely rare in the hands of an oculoplastic surgeon. Such a problem is treated with antibiotic ointment. Sometimes a “bandage” contact lens needs to be used. strong>A stent prolapse. It is important to avoid rubbing the eye, blowing the nose or holding the nose when sneezing to prevent this. If the stent prolapses it will need to be replaced with an endoscope in clinic or it may need to be removed earlier than planned. A prominent or “bow string” skin scar. The incision is designed to try to minimize this risk. To learn more about External DCR, please contact us at today to schedule an appointment.